One of my favorite classes is my Hostess Club. 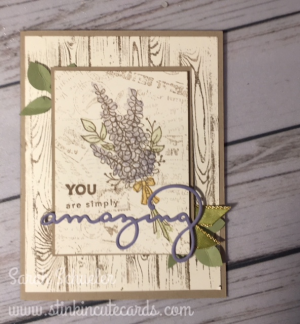 It's so nice to get together with a specific group of stampers and share some really fun ideas. Lots of banter, camaraderie and fun to be had at this event. I do have a number of stampers that are "long distance" and while they can't join in on the local fun, that doesn't stop them from participating in our Hostess Club. Each month I send them all three of the cards that the local peeps have done here in the studio and videotapes of the cards so they can recreate them in person if they want and a "Hostess code" so they can place their orders and have the product shipped directly to their homes. This way they can also participate in the Hostess Benefits of being in the Hostess club as well. This month, each of my three Hostesses earned roughly $100 in free products, each AND a half price item. What's not to love? What are you waiting for? You could have made this card in the studio if you are local or received it in the mail if you aren't! Contact me today to join a Hostess Club, either in person or long distance!